If you have never brined anything, well, you need to! Brining is very easy, it keeps your smoked chicken thighs extremely moist and it takes the flavor of your meat to a whole new level. 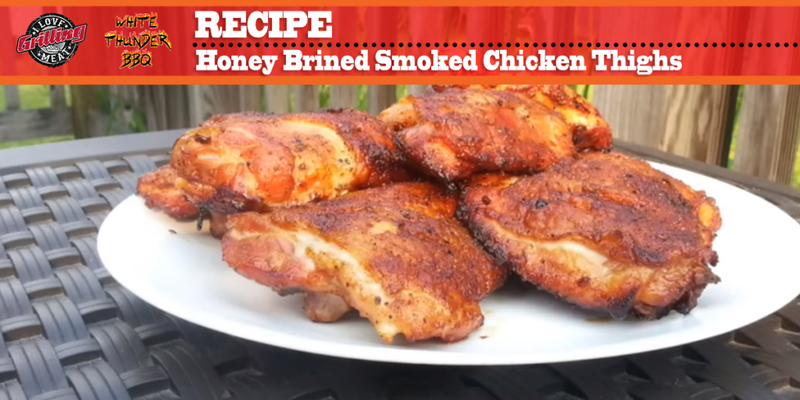 The recipe is super easy: a quick brine and then about an hour and a half cook and you will have some delicious smoked chicken thighs! In a bowl add 2 cups of water. Add 2 tablespoons of salt, about 1/3 cup honey and 1/2 cup of Italian salad dressing. Mix until everything is dissolved. Put the chicken thighs in a ziploc bag. Pour the brine into the bag until the chicken is covered, seal the bag and put it away for 4 to 5 hours. Now it is time to prepare the rub. In a bowl mix 2 tablespoons of light brown sugar, 1 tablespoon of Turbinado sugar, 1 teaspoon garlic powder, 1 teaspoon onion powder, 1 teaspoon ground ginger, 1 teaspoon cumin, 1 teaspoon Kosher salt, 1 teaspoon freshly ground black pepper, 1 teaspoon Ancho chili powder and 2 teaspoons of paprika. Stir well until the rub looks as uniform as possible. When the chicken has soaked in the brine for about 5 hours, apply the rub. Make sure to cover all sides of the meat. In your smoker, use a few chunks of applewood with the charcoal. Place a plate covered with aluminium foil under the rack to gather the juices that come out of the chicken. When the smoker gets up to temperature (275 F), cook the chicken. BEST Homemade Carolina BBQ Sauce Recipe (Yellow Gold) Baste your meat with this gold Carolina BBQ sauce and you’ll feel like a million bucks! Easy Jamaican Jerk Chicken Recipe Take this simple Jamaican jerk chicken recipe and marinate some bone-in chicken in it for about 5 hours for a really delicious meal straight off the grill! This recipe does about 10lbs of legs/thighs. I long will it smoke for? As long as it needs to get to 165 internal temp in these thighs, likely 1.5-3 hours depending upon what temp you smoking them at.